Workarounds for Scheduling Woes: When is Jennie Free? 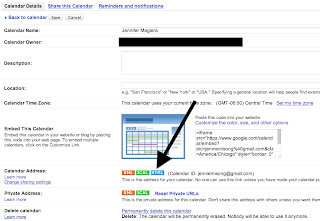 Shared or Public Google Calendars: This works great if you are all in the same network and have public calendars. However a lot of folks (myself included) don't want everyone knowing exactly where we are and what we're doing. So I tend to stay away from this. What is a public "busy" calendar? In your calendar settings, you are able to go to a menu called "sharing". 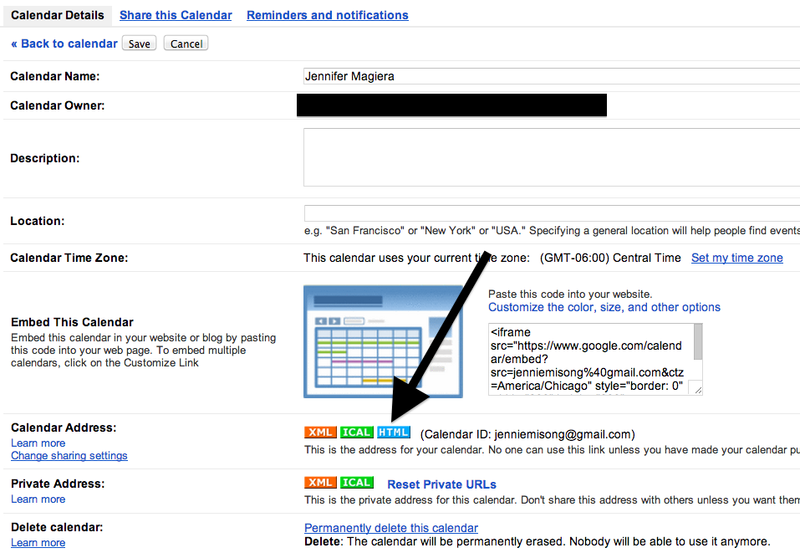 From there, you can decide if your calendar is public or private. Additionally, if you choose "public" you can set it to show only busy/free information - no info on where your appointments are, with whom, their titles, etc. Simply that you are "busy". 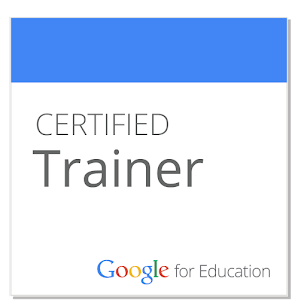 So that could be anything from an epic Game of Thrones marathon to a full-day teacher PD. I love this option because while folks know when I'm busy and can't meet with them, they don't know why or where I am. So some semblance of privacy. 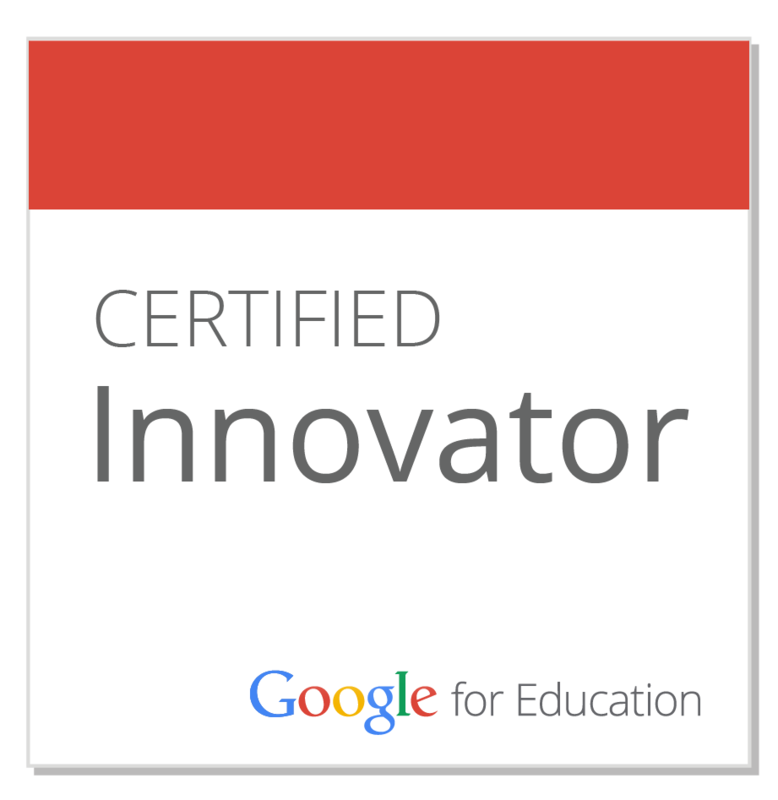 Why did I embed it into a Google Site? You don't have to do this step. In fact, you can find the public "link" to your calendar by going to your calendar settings, clicking on the "calendar details" tab and looking at the bottom of that page. There you'll find "Calendar Address" - and can click on the "HTML" button for the direct web link. I used to share this first link with people when I tried this method (I created a TinyURL for it so I didn't have to memorize the long gobble-dee-gook URL that Google creates for your calendar). HOWEVER, this takes them to the month-view of your calendar... which only shows the beginning time of your busy windows. As such, I had lots of people see I was busy at "9am" and they automatically assumed this was an hour-long slot. So they'd email me and say, "Hey! I'll see you at 10am!" Then I'd have to go back and explain that my 9am meeting was really three hours long. SO - I created a simple 1-page Google Site that embedded the calendar right into it. All it has on it is my calendar and a few disclaimers, explaining how to read the calendar and reminding them of my time zone. The nice thing about putting my calendar in my Google Site - beyond being able to type a quick message or disclaimers to go with the cal - is that when you are embedding it, the site gives you options on what view people see and how they navigate it. 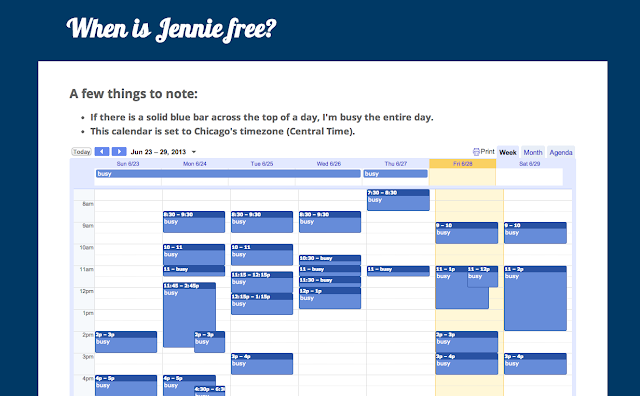 SO, I was able to embed my calendar in "week view" - which shows the FULL busy window. So now I use this public calendar (which I've also created a TinyURL for) when scheduling appointments with one person or with a small handful. When there is a bigger meeting, we still go to Doodle since it allows for easier scheduling across many different schedules. So far, this has been working great for me - and I've gotten lots of "oh wow, how did you do this!?" comments. Thus, this blog post. This is how I did it :). GIF is pronounced with a soft g - as in "jif". To those who dissent, please refer to the creator of the file format, one Mr. Steve Wilhite. Go to 0:45 of this video for final proof on this. END PSA. 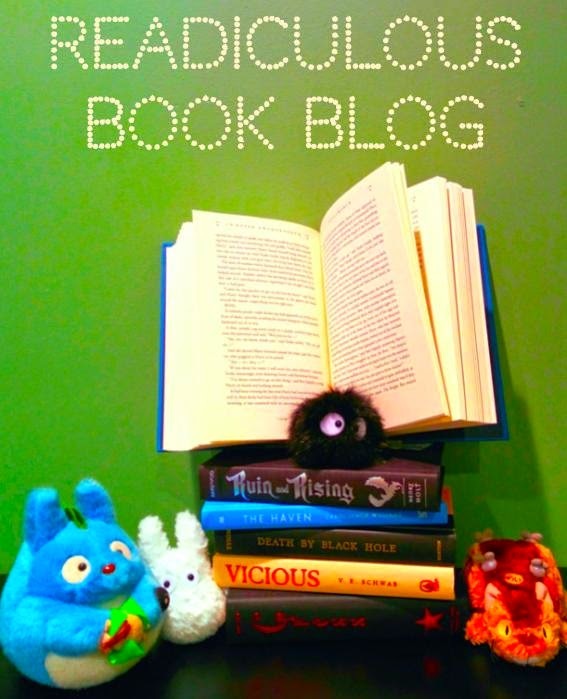 You may now return to your regularly scheduled blog post. GIFs in school! How could this be useful, you might ask? Great question! Think: sequencing - or cause/effect - or cycles in science - or even math problem solving! Imagine your kids are using an iPad app like Drawing Pad or creating a Google Drawing to show the life cycle of a butterfly, the three main events in a short story, the steps they took to solve a math problem... etc. Normally, they'd just send these images to you or post them to a site. What if... they could create an animated GIF - not only because it's "cool" and "fun" but also because these could be an animated way for others to see - in just a few seconds - exactly what the student knows. 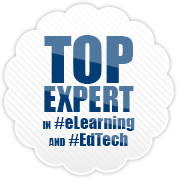 Why not just create a video or screencast? Well, these have their place in the pantheon of student creation - absolutely. However sometimes it's nice to have a quick, succinct visual for kids to show what they know. Moreover, the file size of a video can sometimes be a problem for certain sites, emailing files or even the WiFi in a building. GIFs are mini files that say a lot in a small amount of time and bytes. Additionally, GIFs can be embedded easily into Google documents, websites, presentations - etc... not worrying about sound, uploading to YouTube or embedding from a third-party screencasting site. Recently the amazing Kevin Brookhouser shared this video that teaches you how to auto-create a GIF with Google+. In this workflow, you simply upload a series of photos with similar backgrounds to Google+ and the little droids who work in the Google cloud create a GIF for you. All you have to do is sit back and wait (Kevin says about an hour). Back in January, the amazing Ken Shelton came to Chicago to keynote at our CPS Tech Talk. 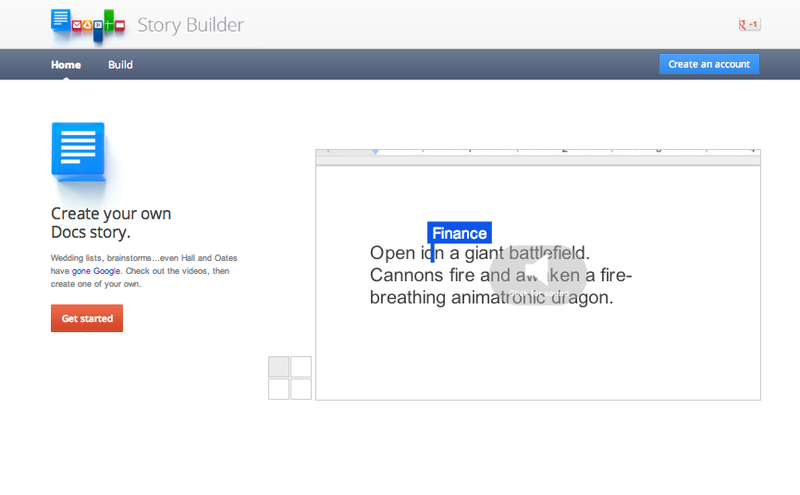 At that time, he showed me a great web-based creation tool: DocsStoryBuilder. 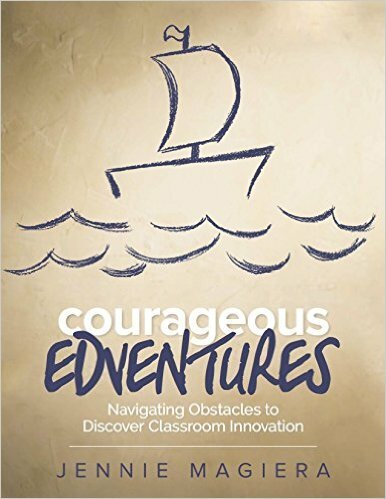 Since then I've used it a ton to provide an expressive outlet for students, illustrate a point and inspire learners big and small (read: kids and teachers). As such, I am beyond thankful to Ken for sharing this site with me. And now I'm going to share it with you! How does it work? Well you get to create "characters" - essentially editors in a fake Google Doc. You have them type or interact in the document - either as a dialogue or editing the text. Then you can add some music - then voila! You've created a funny little video. You can speed up or slow down the typing, add a dramatic pause for effect or change the color of each "character" or editor. Honestly, there's a million ways to use this tool. How have you used (or do you plan to use) it? Share below!